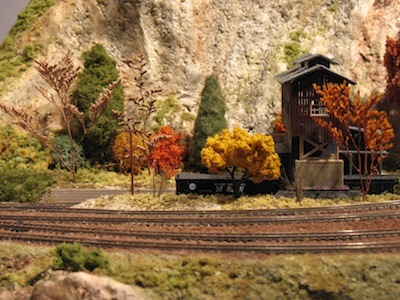 WELCOME to the 11th issue of BYMRr-Zine - a newsletter published by the author of the website Building Your Model Railroad, and devoted to providing breaking news and tips to model railroaders of all ages and all scales in a quick and easy-to-read format. Resources are always credited where appropriate. Thank you for subscribing. 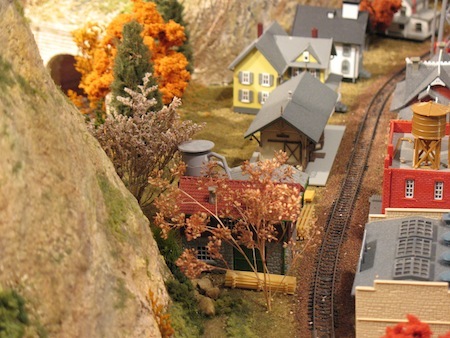 We have lots of new tips and tricks this month to add to your model railroading pleasure. Sign Up: If this has been forwarded to you by a friend and you have not yet subscribed, click here to get your own version sent to your email box free of charge every month. Comments: Let me know if you have any suggestions for improvement on the Comments Page of the website or send me an email directly to gregwarth@building-your-model-railroad.com. View-blocks are basically anything that blocks the viewer’s ability to see something you don’t want them to see from a particular vantage point. A view-block could be a collection of structures, a group of trees, a bridge, a mountain range, or just one hill. It could be as obvious as a backdrop placed between one side of a layout and the other; or, it may be very subtle so that the viewer isn’t even really aware that his/her vision is being directed at only one scene at a time. View-blocks are often used to separate scenes. For example when your train is traveling from one city to another, it would be nice to visually separate the cities somehow so that each city occupies its own scene, perhaps even separated by a rural scene. Otherwise, it gets confusing for the viewer. Each scene should ideally be large enough that your longest train can fit into it comfortably. Otherwise, you will likely have your lead locomotive in Chicago, for example, and your caboose still in Cleveland, which would be pretty difficult to do in real life. In order to create individual scenes, this usually requires a view-block on three sides. The fourth side is what’s left for the viewer to see the scene but not much beyond it. This subtle separation of scenes will not only make your layout very interesting, but it will make it seem much larger than it really is. A view-block can also be used to provide a sense that there is something beyond the scene that is visible. For example, If you have a road or track (or river) going through a scene and then curving away from the viewer as it goes through or behind a view-block like a forest or hill, which prevents the viewer from seeing where it is going, then you have created an illusion that the road or track must go somewhere beyond the scene that is being viewed, even if it doesn’t. As you plan your layout, try to imagine or draw in where your view-blocks should be placed to make your layout seem larger and more realistic. Even if your layout is largely done, you could probably still find places where you could add a structure or some trees to help separate scenes. Reference: “Use View Blocks to Extend Your Layout”, by Gary Hoover, Model Railroader, December, 2011, p38-42. Grass-mats are more plentiful now and are available in almost every hobby shop. They are great for smaller layouts – but could be used on larger ones as well. Place your plywood sheet on a flat surface - preferably a table. You could add a sheet of Homasote or extruded, construction foam on top of that. Glue the layers together with Liquid Nails or similar adhesive. Now you’re ready for the grass-mat. First you have to unroll the mat all the way, then reroll it so that the bottom side of the mat is showing on the outside of the roll. Then place the roll on one edge of the layout. Allow about 1-2 inches of overhang on the end and on each side of the layout. You can cut the overhang either before or after gluing it down, but it’s probably easier to do this afterwards. After it’s all unrolled, then you can fold down the edges onto the side of the plywood and either glue down the edges or nail them down. Both is probably better. If you want to add a hill or mountain later, you can do this by building up the mountain or hill with pieces of foam sheets cut the way you want. Glue the pieces together where you want the mountain. Then cut a section of the grass-mat to fit the mountain you want to cover. Spray the adhesive glue over the mountain and then apply the mat. If you have one of the newer grass-mats that are moldable with heat, you can now apply the heat gun to make the mat conform to the mountain shape. It won’t matter if there are wrinkles in the mat here since they can be covered with trees or bushes later. If the entire mountain doesn’t get covered, you can add more pieces to fill in the spaces. You can cover the seams later with your scenery and ground cover. When laying track, there will often be uneven rail joints where one rail is slightly higher or lower than the adjoining rail. This can cause derailments; so you want to be sure those rails are joined flush with each other. You may not be able to see this misalignment very well, but you can often feel it by rubbing your finger along the rail joint. You can then use a small piece of plastic or wood as a shim under the lower rail, or rail tie, to bring it up where it should be. It would probably be a good idea to solder this joint when it’s aligned properly so it doesn’t get out of alignment again. As you add more track feeders and electrical accessories - like lights, turnouts, animated motors, etc to your layout, the collection of wires under the layout can grow into a mess of disorganized loops and tangles. If you have to troubleshoot an electrical problem, you have no idea where to begin. As you do your wiring, for each strand of wire that you run, put a tag on it that tells what it’s for. Adhesive labels, like those in office supply stores, are good for this. Then to make your wiring neater and to keep them up and out of the way, attach wooden clothespins, using wood screws, to the underside of your layout or to the inner aspect of the layout legs. Then as you run new wires under the layout it’s easy just to put them together with the other wires in the clothespin clips as they run along the underside of the layout. As you are laying track, if your design calls for an S curve, if you don’t do this right you will have constant derailments. You must make sure that the middle section of the S curve is straight for a long enough stretch that your longest car is straight and not on a curve as it goes through the middle of the S. If there is no straight section in the middle of the S curve, or if the straight section is not long enough, you will have problems with it. Better to know now before you have to tear it up and start over! 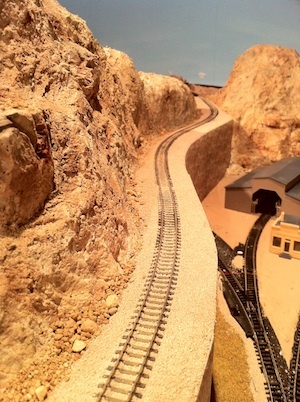 If your layout is mostly done and you want to add a lighted accessory or structure to the middle of the layout, you could drill down to the bottom of the layout to run your wires through, or you could make good use of your telephone poles on the layout. Use very thin wires and glue them to the tops of the telephone poles all the way from your power source to the accessory. Now who would have thought…?! Make your era obvious to your viewers by making your own decals or billboard signs using printouts of old photos from the Internet. Find cars, trucks, people and structures from that era to display on your layout. Also, research what locomotives and rolling freight were in use at the time and try to be consistent if you can. This will make your railroad look more realistic. 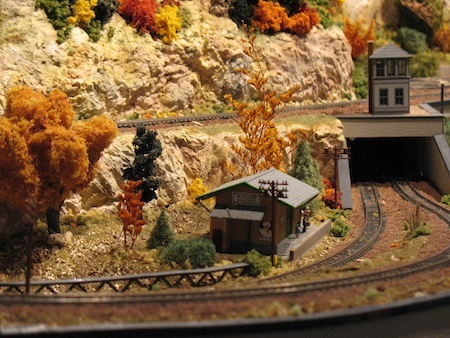 Thank you for your support and for subscribing to the free BYMRr-Zine, the newsletter for Building Your Model Railroad.